SHE'S MET THE BAND: Brooke Barker, second from right, hangs out with some of the band members. October 20, 2006 | Some may call it stalking; others would say "groupie." I would choose the word "luck." The night I first met Ryan Shupe and the Rubber Band, it was totally unexpected -- and will probably stay in my memory for a long time. Let me give you a little background information. I've seen the band perform four times in the last year, I know all the songs by heart, we listen to them on a weekly basis at my apartment and I almost drove an hour last month, when I heard they were speaking in my hometown, Farr West. Needless to say, I love them. I'm also journalism student, and have been covering ABC's Extreme Makeover: Home Edition for the Hard News Café. There have been several perks this week. I was able to talk to the family on Sunday and see the joy on their faces, I have also been able to get an insider's perspective by talking with members of the crew and talent, I've gained a respect for the "everyday people" who are helping out on this community project around the clock and I've gotten to see some amazing things. Ryan Shupe and his band members -- Bart Olson, Colin Botts, Craig Miner and Roger Archibald -- are some of those amazing people who have devoted themselves, their time, money and energy to the cause. These are people I've come to call "angels without wings." It was business as usual Wednesday night: meet the band (which I thought was going to be Isaac Hayden), do an interview, write a story and call it a night. However, when I walked into the room, I was surprised to meet several smiling, goofy and energetic guys -- not Isaac Hayden. What a shock! I'd been told the chances of talking with them would be slim to none, and not to expect it. Maybe I should have at least prepared something in case. Next time I will. They broke away from their Ernie from Sesame Street impressions, a palm pilot Risk game was put away, and we started. I knew these were just normal guys who like to play musical instruments and sing on the outside, but I found they have incredible hearts beneath their T-shirts and distressed jeans. "We just found out about this like five days ago," said Shupe. "I guess they had to keep it all on the down low, and figured we'd tell someone." Every member of the band has seen the show, and loves what it does for people. Luckily they were in Utah, and jumped at the chance to come play for the benefit concert, which raised more than $11,000. "There's a special place in my heart for Logan," said Shupe. The band played to a packed Kent Concert Hall last spring, and also at Cache Valley's Summerfest. Archibald said they've also been to the Howl. "We're part of something bigger here," said Shupe. "We don't have to know everyone to be part of it. We're just going to go out there and rock it like a hurricane!" The band members all said they just wholeheartedly wish the best for the Pauni family, and after getting the crowd of more than 2,500 cheering about corn dogs and dreaming big, they took a chance to head down to the construction site and see it. I know this because my roommates and I ran into them there as we were walking back to our cars. This was already after they'd taken the time to get a picture with us at the Spectrum, while signing autographs. I found out that Shupe went to Weber High School in North Ogden -- my high school's rival, which may be a problem -- but I'll try to look past it if I ever run into him again. Ryan Shupe and the Rubberband really are just five normal guys with big hearts, and they honestly made everyone in my apartment's night. 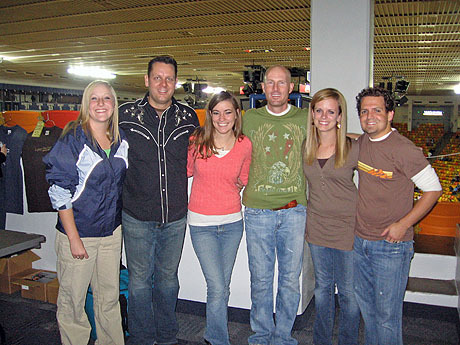 Of the six of us, there were three very happy girls to have their picture with the band -- including me, just a fan.